The main problem with dealing with such encrypted disks is that you can’t get rid of the return the disk back to it’s original state (unencrypted and managed by windows) no matter how much you format it. The reason for that is because the encryption software (in my case it was PGP by Symantec) creates something called a “boot guard” a gate keeper to the hard drive, if you will, on the head of said disk. The header can’t be accessed using the normal format utility of windows or third party software. However, there is hope for those stuck because there is a utility called “DiskPart” that is built in Windows XP, Windows Vista, and Windows 7 that performs low level formating (explained later in this article) and as a result helps destroy the instrumentation data contained in the bootguard. That way the disk just “forgets” it is encrypted with the vendor’s software and you will then be able to do as you please with the disk. Windows XP: Click Start > Run and then type cmd and press Enter. 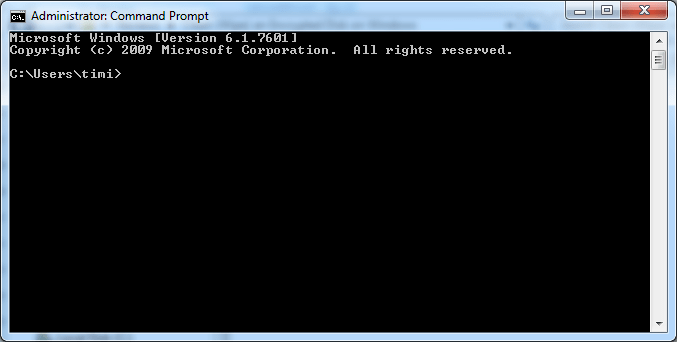 Windows 7 & Vista: Click Start and type cmd in the start search field and press Enter. You will then open the DiskPart application by typing “diskpart” followed by Enter. 3. Now we need to select the disk we will clean/wipe. Let’s first list the disks by typing “list disk” then press Enter. Congrats now you can use Disk management or any third party software to partition your disk and you will notice that PGP or any other disk encryption software will see your disk as unencrypted and not managed by it. The reason DiskPart works in contrast to other methods is because as we mentioned before it performs “low level formatting” , that means it formats down to the level of the disk sectors as opposed to the normal format (also called high level formatting) which operates at the file system layer. To find out more about low level and high level formatting, you can refer to the following article here. This entry was posted in Security, Software, Windows and tagged boot guard, Clean wipe, diskpart, encrypted disk, encryption, formatting, hard disk, low level formating, PGP, Windows 7, Windows Vista, Windows XP. Bookmark the permalink. Hey There. I discovered your blog the usage of msn. This is a very neatly written article. I’ll be sure to bookmark it and return to learn more of your useful information. Thank you for the post. I’ll definitely return. Tried Diskpart- got so far but it was unable to find the flash drive in list disk All it showed was my C drive. I am using storagecrypt software. Any assistance welcomed. Still using XP. diskpart is a low level tool so if the flash drive is not shown in the disk list then it is possible the PC does not detect the hardware. Do you see your flash drive in the windows explorer? Didn’t work. Says disk is invalid when clearly i have the right disk number.. This doesn’t help at all.. Sorry to hear you’re having difficulty in cleaning the disk. Can you send the exact commands you have used along with the outputs displayed so I can help resolve the issue? It looked very promising but it gives me error message virtual disk service error: clean is not allowed on the disk containing the current boot, system, pagefile, crashdump or hibernation volume. Any idea how to create another disk, partition or volume? Looks like this article is a bit behind the times. We use McAfee Encryption. I’ve dealt with Bitlocker and some of the others before and you can always at least count on salvaging a drive for re-use/ re-circulation by simply using diskpart. Even Bitlocker drivers would show up in disk management, but could not be deleted anywhere but in Diskpart. This McAfee, however, is a bear. It will not show up in Windows at all. The only place it shows up at is in the pre-boot environment. I tried Knoppix and Gparted, and it won’t show up there either. The only thing that I have read works is PSID Revert methods, but that will take me some learning.